Starting our discussion with a very simple question at this stage, What are muscles? We may define muscles as, bundle of muscle fibers, which are able to contract and relax. Like all other parts of the body, muscles are also supplied with blood vessels which bring them nutrients and carry with them their metabolic waste. 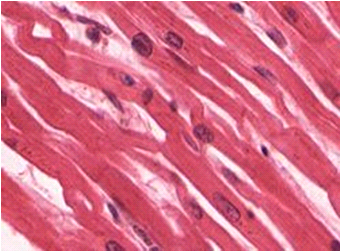 These are the muscles, which are found in the walls of the organs. Such as blood vessels, digestive tract etc. They are actually involved in the movement of the material flowing through such organs. 1. Earliest form of muscles to evolve. 3. Long and spindle shape. 4. One nucleus per cell. 5. Low speed of contraction. 6. Receive nerves from the autonomic nervous system (not voluntary). Cardiac muscles are only found in the heart where they constitute a considerable part of the heart wall. It is self-stimulating. Heart muscles consist of chains of single cell, having its own nucleus. These chains are then organized into fibers. 1. Irregular strips are present. 2. Are not under the voluntary control. 3. The fibers are branched and interconnected. 4. Help the heart in the pumping of blood. 5. Speed of contraction is intermediate. These are the muscles, having regular strips, and connect the muscle to the bone. These are actually concerned with the locomotion. 1. Cylindrical or spindle shaped. 2. Can be controlled voluntarily. 3. Speed of contraction may be slow or fast. 4. Alternate dark and light bands are present. The dark band is called A-band,since it is anistropic (polarizing i.e, it can polarize visible light). For memorizing, you can take the first letter of anistropic and isotropic for A and I band respectively. Now, the A-band and I-band are further divided into different lines. The A-band which is the dark band has a middle brighter strip which is called the H-Zone( h for hele,means bright). This is the region of A-band where the filaments do not overlap and only myosin filaments are present. The H-zone has a middle line called, M-Line. It is a dark line. This is actually the distance between the two Z-lines. It represents the functional unit of the muscle cell. 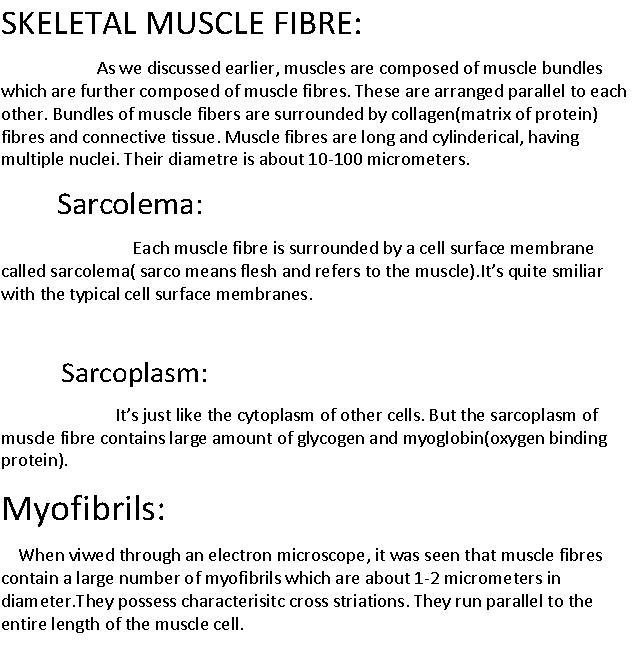 There are thousands of sarcomere in the myofibrils which actually bring about the contraction. The thin filaments are made up of a protein, called actin. Each actin filament is composed of two helical strands of globular actin molecules which are twisted around each other. On the other hand, the thick filaments are made up of a protein, called myosin. Myosin molecule has two disticnt region; a rod shaped region is present which is called myosin rod or myosin tail. It conatins two long polypeptide chains and myosin head is present which consists of two globular parts. The heads are also called cross bridges since they overlap the thin and thick filaments. The thick filaments are present along the A-band. The thin filaments are present along the I-band. These are the two accessory proteins which are present on the actin filaments. They play a important role in the contraction of muscle. Troponin is a three polypeptide complex. When the muscle is at rest, then the tropomyosin block the site on the actin filaments where the myosin has to be attached. When the calcium ions are released from the sarcoplasmic reticulum, they attach to the troponin, which causes the tropomyosin to move away,hence, the site for the attachment of myosin on the actin filaments becomes available for the myosin. 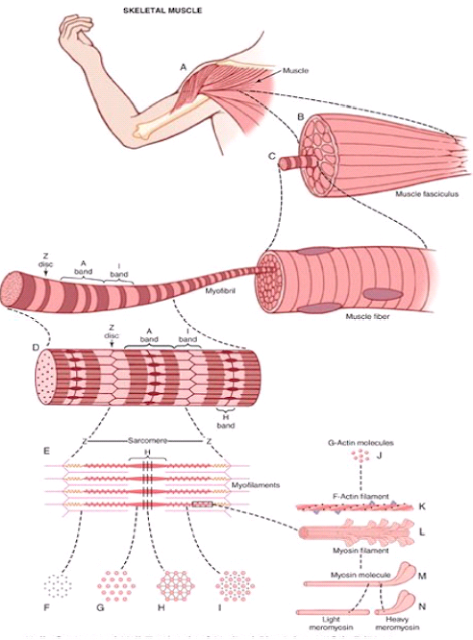 You’ll thoroughly understand this mechanism of muscle contraction in the above discussion. According to this model, when the muscle contracts then the thick and thin filaments overlap in such a way that the I-Bands are reduced in lengths while the z-lines come close together. 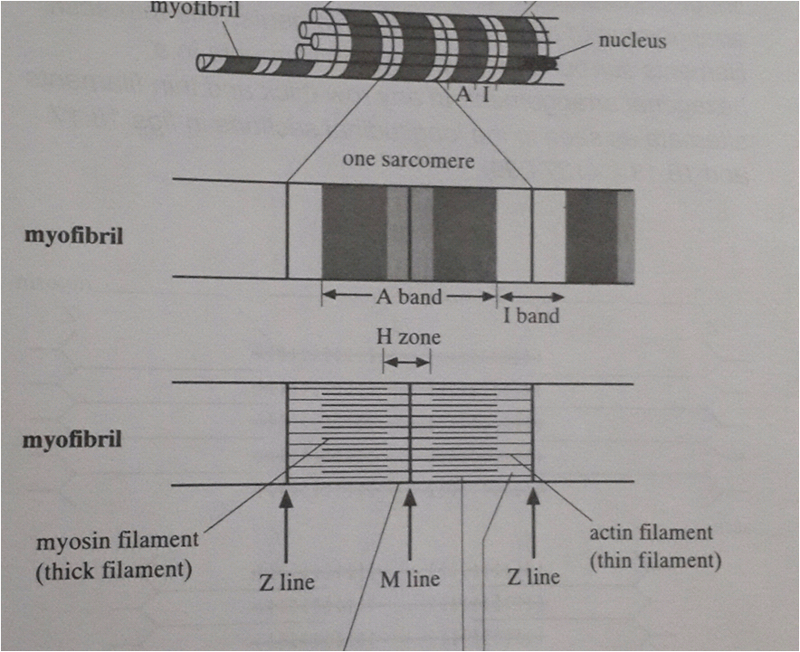 Obviously when the filaments will contract the I-band will become shorter and because of this the z-lines which bisect the I-bands will also come close together.Infact the actin and myosin filaments overlap, when the thin and thick filaments move past each other. The myosin heads,also called cross bridges, become attached to the binding site on the actin filaments and hence during contraction, these cross bridges contract. Contraction of cross bridges pull the actin filaments. Which then bring about the contraction. 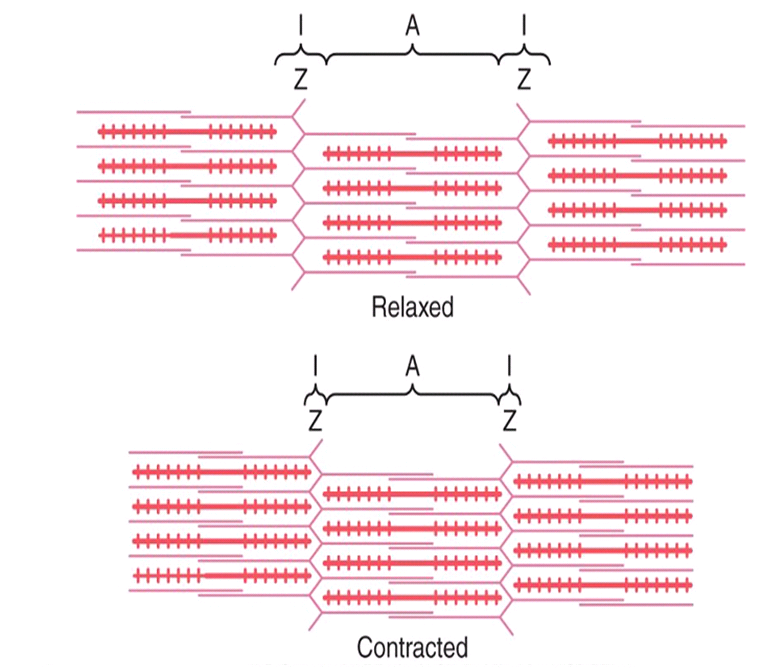 Actually, this contractions is due to contraction of the sarcomere, which is the functional unit of muscle cell and represent the distance between the two z-lines. 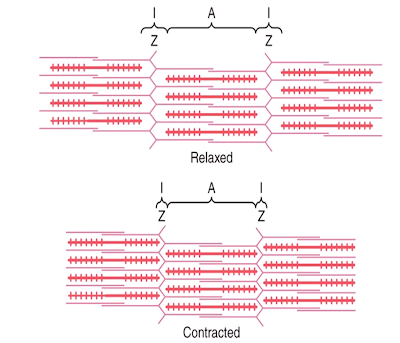 After sliding has occurred, the bridges are detached so that the myosin filaments regain their original position. The mechanism is shown clealy in the figures given below. HOW THE WHOLE PROCESS IS CONTROLLED? When the nerve impulse arrives at the neuromuscular junction ( a junction where the neuron is attached to the muscle), then this causes depolarization at the T-tubule system. Now what is T-tubule system? 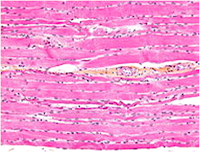 The sarcolemma folds inwards towards the sarcoplasm and forms tubes, a system of which is called T-tubule system. Furthermore, calcium gates are present in the sarcoplasmic reticulum. 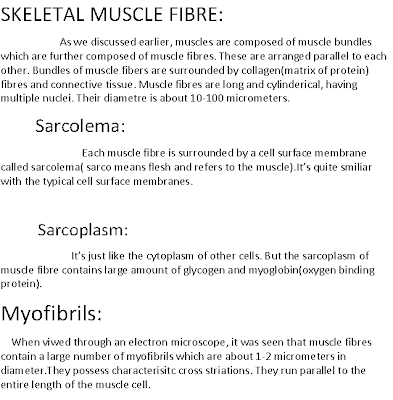 Sarcoplasmic reticulum is a specialized system of endoplasmic reticulum in the muscle fibre. 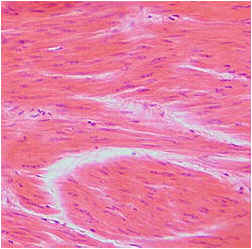 These form vesicles or swollen lines at the Z-lines of sarcomeres. When the nerve impulse, reaches the neuromuscular junction, then depolarization occurs along the T-tubule system. This causes the sarcoplasmic reticulum to secreate calcium ions through calcium gates. 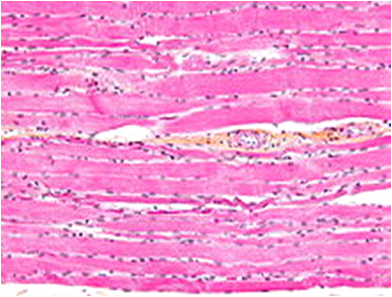 These calcium ions then cause the troponin and tropomyosin, present on the actin filaments to move slightly. In this way, the binding site on the actin filament is exposed and myosin heads can attach their to form cross bridges in order to bring about contraction. The energy for all this movement is provided by ATP. An enzyme, ATPase hydrolyse Atp to APD and phosphate in order to release energy from it. 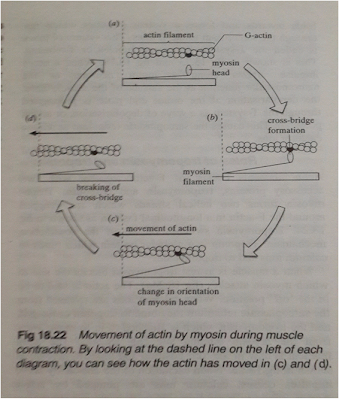 Morever, each myosin heas has ATPase for carrying out this activity. The use of atp accounts for the fact why muscle cells need lot of mitochondria to supply energy for muscle contraction. Furthermore, creatinine phosphate is another substance that gives energy when needed, during high rate of metabolism. When there is deficiency of oxyen, then anaerobic respiration occurs to provide the cells with energy. However, this process converts glucose into lactic acid which accumulates and causes muscle fatigue. When the body gets sufficient oxygen once again, then this lactic acid is broken down into glucose.